Nelson Tiny Houses is a locally-owned, family run and sustainably-produced company that builds superior tiny houses. As builders and designers, we are inspired by the mountains, forests, lakes and culture of this special part of southern British Columbia. As such, we view building tiny houses as a place where science meets art, where trade meets craft, where a shelter becomes a home. Seth first started building homes at 18 when he helped his father, an architect, build his home in New Mexico and has been building homes ever since. 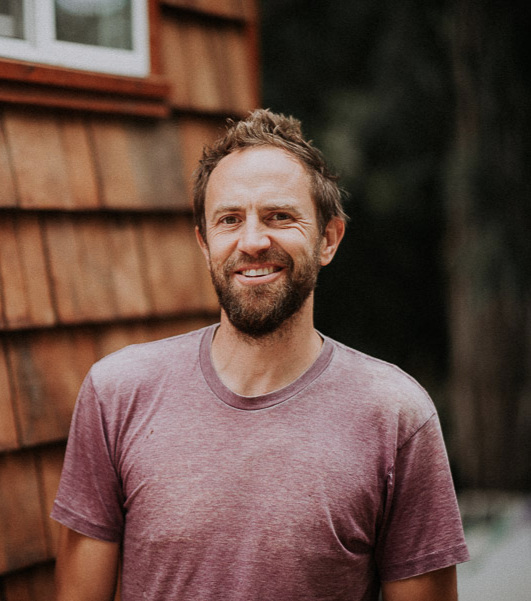 Seth has travelled extensively and has experimented with a myriad of building styles including adobe, ICFs, hemp-crete, Morroccan tadelact, traditional 600 year-old European homes as well as conventional builds. Seth spent 3 years living in a teepee in rural Washington state where he first experienced the freedom of living with less. After returning to North America after 3 years over seas and feeling discouraged with the lack of sustainability and scale of modern builds, Seth’s interest in tiny houses was sparked. He decided to build a tiny guest suite on his family’s property for his in-laws. Built almost completely from recycled material, the outcome was a ‘one of a kind’, cozy little structure. He loved the different challenges that arose in the building process and the need to make every inch count forced a more thoughtful way of building. After the pile of salvaged material was turned into a tiny “in law” house, Seth was hooked—and Nelson Tiny Houses was born. Madelaine and I would like to sincerely thank Nelson Tiny homes for building our dream tiny home! When starting our journey we struggled with all the options/builders out there that created similar products and services. What stood out about Nelson Tiny Homes was their commitment to their values which was building something truly authentic and unique for their clients while using as much "repurposed material as possible." To us, this was important in making our decision. We wanted to support a company that put their clients' and the environments needs first! In a society that has valued cost cutting and mass production it is extremely refreshing to find a company that believes otherwise. If you are looking to find a builder that specializes in creativity and creating something that is truly one of a kind – I would highly recommend Nelson Tiny Houses as your first choice! Again, thank you for creating a product and experience that Madelaine and I will never forget! I have been living in my Nelson Tiny House built home, winter wonderland, for over 2 years now. I couldn't be happier with it! I approached Nelson Tiny Houses because of their location in BC and their online presentation. Their web gallery and noted experience gave me the impression that they were craftsmen who enjoyed their work, and employed a sustainable approach to building and to life. In meeting Seth Reidy, owner of NTH, I found him to be friendly, knowledgeable, and a very experienced home builder. Most importantly, I found him to be very honest and authentic. Together we worked through the pros and cons of my design and came up with a final design we both felt great about. The project timeline and budget were well defined and the communication during the build was excellent. Nelson Tiny Houses were knowledgeable about local building codes and built my home to meet or exceed the codes. Seth and his team of craftsmen surprised and thrilled me with how they brought the design to life. I was welcomed at my periodic site visits, and felt they listened to and responded to my questions or concerns. I truly enjoyed the process of watching my home come to life. I would highly recommend Nelson Tiny Houses to people who are looking for a quality, sustainably built, tiny home! When Nelson Tiny Houses was just in it’s early stages, I came across the first home they built on display downtown. I was impressed by the quality of the build, the charm of the home and the ingenuity of the design—I instantly saw the value of tiny homes as rental properties to not only create passive income, but also to help deal with the local housing crisis. I purchased that home on the spot and have since had 5 more homes built with Nelson Tiny Houses—each one is a work of art. The quality of craftsmanship, the attention to detail and the custom nature of each house is remarkable! My relationship with the company and with Seth has grown beyond just a business relationship. The personable team loves what they do and brings this passion and integrity to every build. If you are looking for a company to build your tiny home, look no further! My wife and I have so enjoyed the process of working with Seth and the team at Nelson Tiny Houses that we decided to write this testimonial letter. We did a lot of research before deciding on a builder for our tiny house. We visited other tiny house builders, and also visited with a client of Nelson Tiny Homes to see the finished product. The person with whom we met had nothing but positive comments about her experience with Seth and the staff at Nelson Tiny Houses and we were impressed with the finished product when we toured her completed tiny house in person. We met with Seth and visited the Tiny House building facility in Nelson, British Columbia before deciding who to build with.After all of our research and travels it was an easy decision to build with Nelson Tiny Houses. Seth has a passion for tiny houses, and a proven track record of building quality houses. He includes a warranty on the build quality of each tiny house. Seth has been very easy to deal with - he has been positive, fair, and really enabled us to have significant say in the building process. He was able to incorporate some unique ideas into the build of our home (including murphy bed style bunk beds to increase the sleeping capability of our house). The Nelson Tiny Houses team always made us feel welcome – in fact, made us feel like family when we went to Nelson to check on the progress of our home! Our tiny house was completed on schedule and on budget. Seth actually went above and beyond the call of duty when after our tiny house was completed - he arranged for a place for us to store it until we were able to secure a suitable property to put the home. Seth deals fairly and with integrity. We would not hesitate to work with them again in the future. We are so thankful we choose Nelson Tiny Houses and would definitely choose them again in the future! One last thing we would like to mention is how much fun the building process was. Seth kept us up to speed on how the project was coming along, and it was a fun process to collaborate and decide together on some of the unique features of our house. Our opinion is that Nelson Tiny Houses is the best tiny house builder in Canada and we would highly recommend them to anyone who is looking for a tiny house to be built! I love my tiny house! It feels so spacious, is filled with light and has so many practical as well as beautiful features. Working with Seth and his team was a delight. I felt secure in their professional knowledge and experience with building tiny homes but was also made very comfortable giving my input and ideas throughout the build. We truly worked as a team! I was given regular photo and email updates along the way. But the best part has been living in my gorgeous home! The attention to detail is outstanding… I’m so grateful to Nelson Tiny Houses for making my dream tiny home come true and highly recommend them to anyone looking to build a tiny house!